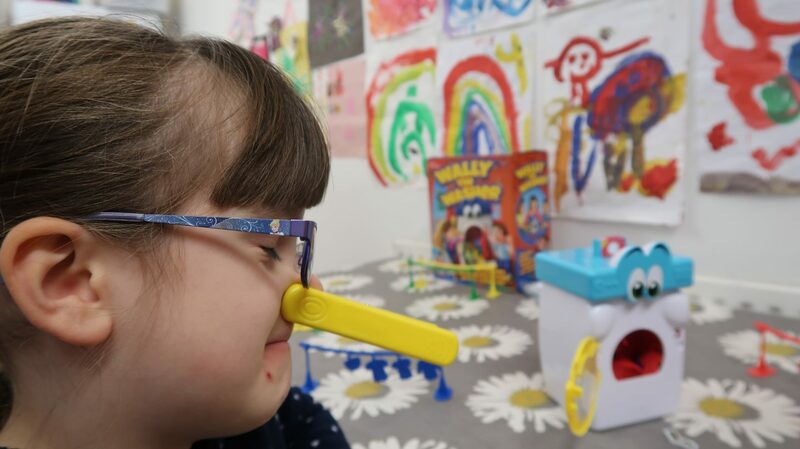 This month we have been working with Drumond Park to review some of their fantastic games for kids. 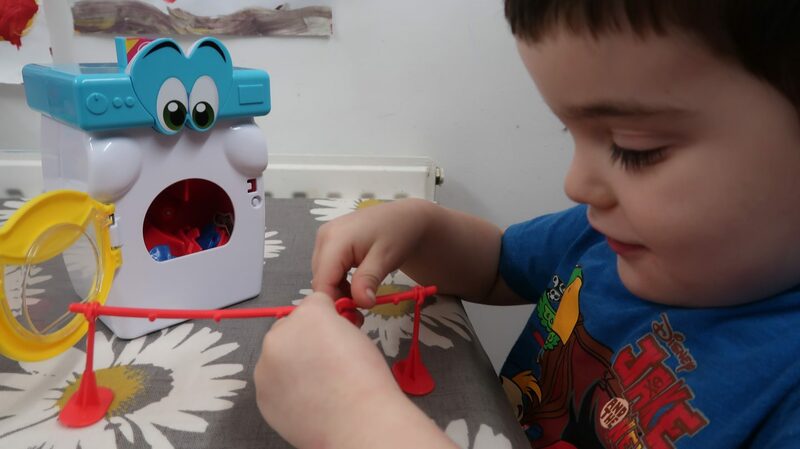 Next up it’s Wally The Washer which has definitely been added to my top five favourite family games, its brilliant ! 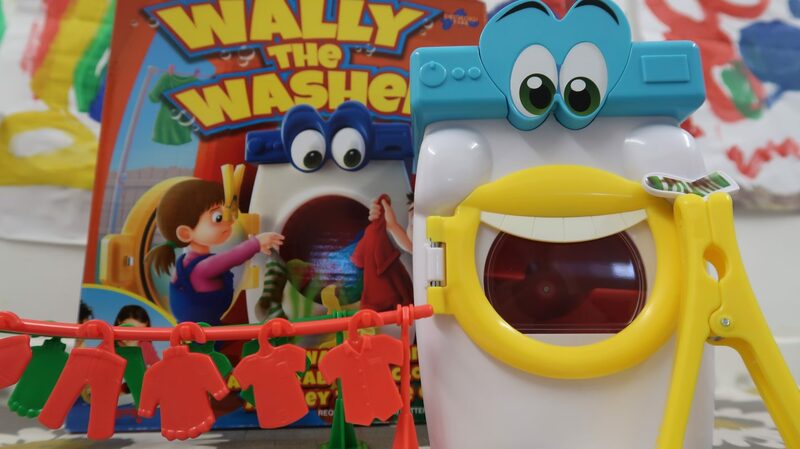 Wally The Washer is not just your average washing machine, fill him up with laundry, watch him spin then try to grab your clothes as they come tumbling out. 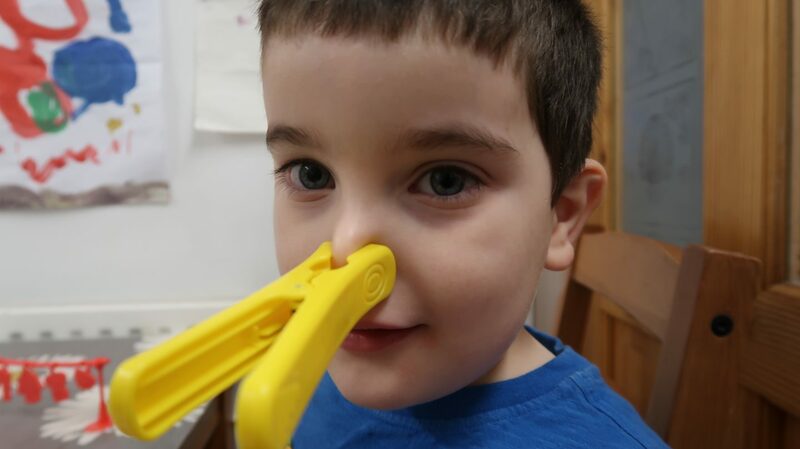 Watch out though, if the smelly sock tumbles out during your turn you have to wear the peg on your nose until the sock comes out again. The aim of the game is to be the first player to finishing hanging all their washing on their washing line. If two players’ final pieces come out in the same turn the fastest person to hang their last piece up is the winner. Assembling the game was quick and easy and we were soon set up and ready to play. Daisy filled up the washing machine with hers’ and Jake’s clothes, they were both really excited to see how Wally would spin. 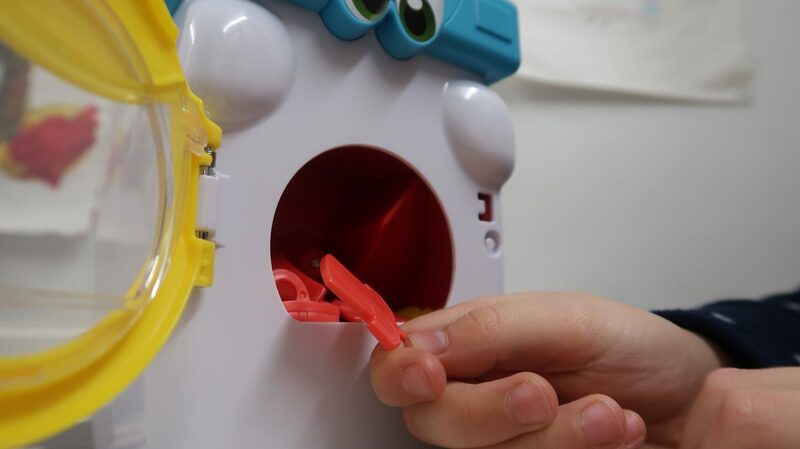 Jake went first, closing the door to make Wally spin and then pressing down on the soap box to open the door. There was lots of excitement and giggling when the door flew open and the clothes came tumbling. 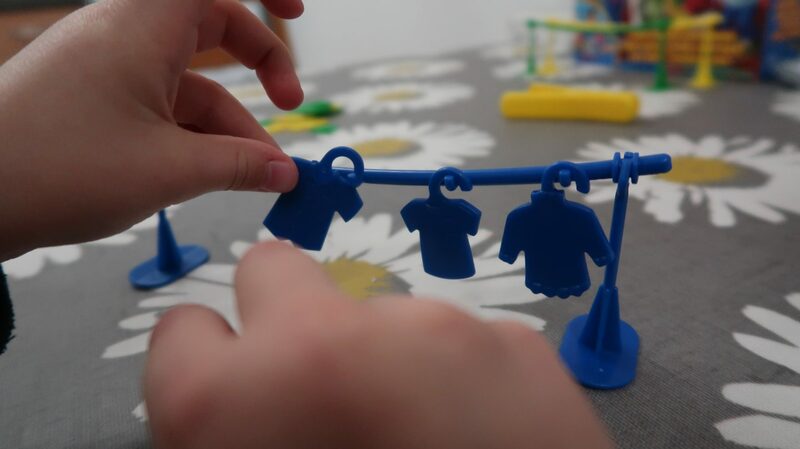 The kids quickly retrieved their pieces and hung them on their washing lines. I love how simple this game is for the kids to play, this means they can play alone or with us adults. When the smelly sock eventually flew out the washing machine the kids were delighted, I think this feature adds an extra element of fun to the game. Jake was the first to wear the peg closely followed by Daisy. The victor of our first round was Jake, as you can see he was over the moon to be crowned champion. 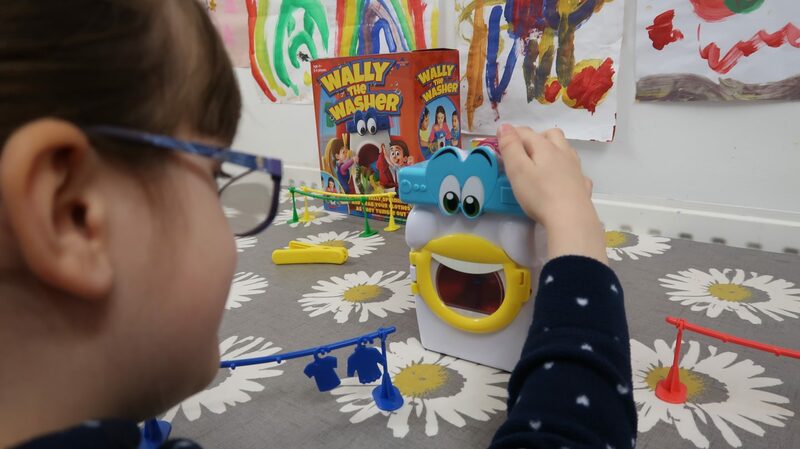 Wally The Washer is lots of fun for the whole family to play, we absolutely loved it. 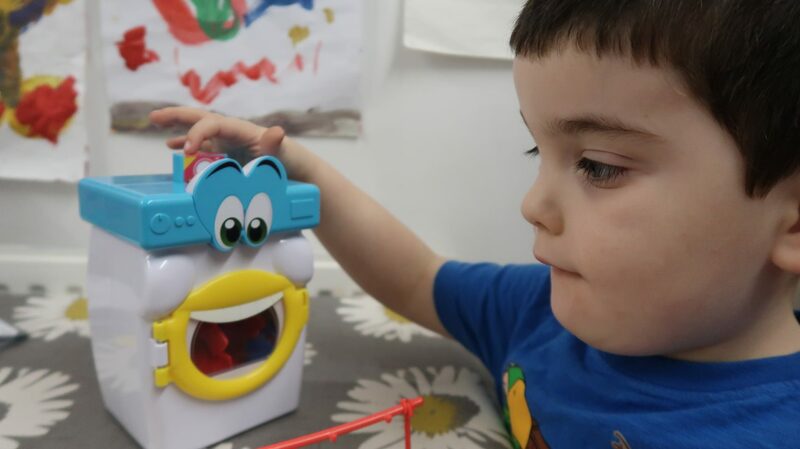 Wally The Washer is suitable for ages 4+ and is available to buy from Amazon, The Entertainer, Argos and other good toy retailers. 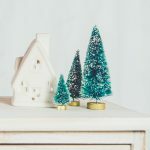 How would like to win your very own Wally The Washer, you can enter the giveaway below using the gleam app. Make sure you come back daily for an extra bonus entry. Have a read the terms and conditions and good luck with your entry. The Closing date is 04.12.2018 11.59pm. The prize is a Wally The Washer game as stated above. Disclosure: We were sent Wally The Washer free for the purpose of this review. All opinions are my own. This post contains affiliate links see our disclosure policy for more information. The bathroom! Saying that though, I’m a cleaner for my job and other people’s toilets are worse than mine so I guess it’s a pleasure! My least favourite room in my house to clean is the bathroom. I hate cleaning the kitchen. In particular the oven is a nightmare to clean. Probably the kitchen as the floor always gets covered with muddy paw prints, however carefully I dry the dog’s paws before I let her in! The conservatory… all those windows! The kitchen. So many surfaces and appliances to keep cleaning. The bathroom, I hate it as it’s so old & lots of crooks n nooks to get into! The kitchen. The children are creating new washing up even as I switch the dishwasher on! my livingroom I absolutely hate it it’s like everyone in the house sees a surface and immediately thinks oh that needs covering and decide leave their junk everywhere! I think it would have to be the kitchen especially the oven. The bathroom, hate toilet cleaning! That would be the kitchen as it is the arrest room in the house. The kitchen, especially the dreaded oven. 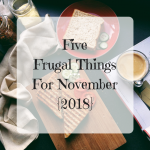 The kitchen – especially the oven! Definitely the bathroom – hate doing the plugholes in particular! The Kitchen as there is just so much more to clean. The kitchen is a nightmare and we are currently having building work done and the kitchen seems to be taking the brunt of the dirt. The utility room. Always loads of muddy foot and pawprint. Have to clean the floor every day. omg the bathroom! i absolutely hate doing it! It has to be the bathroom, it’s such a chore scrubbing down the tiles and the shower. Bedroom. Would love this for my niece. The kitchen. I clean it, leave and within seconds it seems to be a mess again! Bathroom, every time. I can doo every other room without rubber gloves! The Bathroom is never nice. The kitchen as it has the dreaded oven! The bathroom although to be honest there is no room I enjoy cleaning! I must admit it’s the kitchen and the tile floor. Having a large dog doesn’t help this weather when he’s in and out of the garden quite a lot (shouldn’t complain but the floor does get messy) and the oven is my bugbear. Also absolutely hate trying to hang sheets out on the line (the washing machine is in the kitchen so that adds to it lol). Any room that needs dusting…. I hate dusting!!! !